I love this time of year because I get to make warm nourishing soups! I'm partial to pureed soups because to me they are comforting and can be enjoyed in a bowl or sipped in a cup. 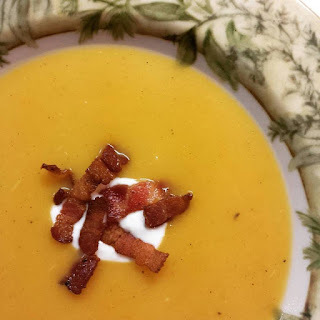 The sweetness of the butternut squash is balanced beautifully with the tart apples and smoky bacon in this soup. A dollop of Greek yogurt also tempers the sweetness of the butternut squash and adds a little creaminess to the soup. Enjoy! 1. In a large pot, cook the bacon over medium heat until it is crispy. Transfer the bacon to a paper towel lined plate and reserve. Leave the bacon fat in the pot. 2. Reduce the heat to medium low. Add olive oil, onions, carrots, celery and bay leaf to the pot and cook until the vegetables have softened. 3. Add the cinnamon and cook for another minute. 4. Add potatoes, apples and butternut squash. Season with a little salt and pepper. Add the broth and increase the heat to high. Bring the soup to a boil then reduce the heat to a simmer. Cook uncovered for 20 minutes or until the vegetables are cooked. Discard bay leaf. 5. Puree soup in batches in a blender (caution hot!) and return the soup to the pot. If you want a thinner consistency, add water. Adjust the seasoning of the soup with salt and pepper to taste. If you want, add a little more cinnamon but not too much. 6. Serve the soup topped with Greek yogurt and reserved bacon.